Put your beer pong skills to the test with this robotic cup caddy. Your new robot drinking buddy, that's who. Rack your cups on top and watch as it changes up your basic beer pong game, whizzing the cups around the table to make for a more challenging shot. And don't worry, this robot can handle its beer—smart sensors inside keep it from rolling off a surface or bumping into anything. Just charge it up using any simple cell phone cord and let the party begin. Note: This robot rolls solo, so make sure to order two if you want a fair match-up. Designed by Eric Fragola. Made in China. With a deep appreciation for the diverse culture of San Francisco and an affinity for tech-centric Silicon Valley, Eric Fragola is all about combining science and creativity. Self-taught and self-made, he has learned to embrace setbacks and failures as some of his greatest learning experiences. He hopes his creations open up new channels of communication and unite people in unexpected ways. General care: Do not submerge in water. Clean with a damp cloth only. If a cleaner is needed, only use bleach free products. Charging: Use only certified charging blocks and standard micro USB charger. Please note: charger and cups are not included. THIS THING IS SO COOL!!! "This thing is so cool ! I love that there's no set up. We just carry them in a little reusable grocery bag along with snacks to our friends. We just ordered another set as an xmas gift. I still haven't had to charge mine even after a few games. We used some generic cups which did well but I think the solo cups work the best. I just feel better about how they fit. This item is sold as a single unit. 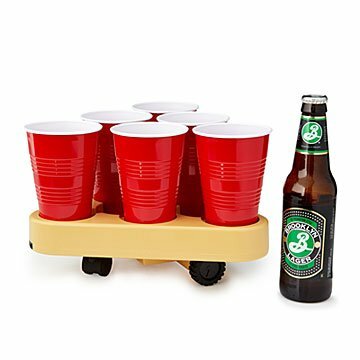 You can have plenty of fun with one, but make sure to buy two if you want play with a traditional beer pong set-up.